The Vozdvizhenskiy is a luxurious hotel situated in the very heart of the architectural center, Old Kiev, on one of the most ancient streets of Kiev. The Vozdvizhenskiy hotel offers 24 comfortable rooms which includes 11 single rooms, 4 twins, 1 business suite, 4 deluxe suites, and 4 economy-class rooms. 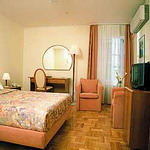 All the rooms are equipped with air-conditioning, minibar, satellite TV with 48 channels, and direct-dial telephone. Every morning, the hotel cafe offers you an excellent buffet breakfast which is inlcuded in the price of your stay.